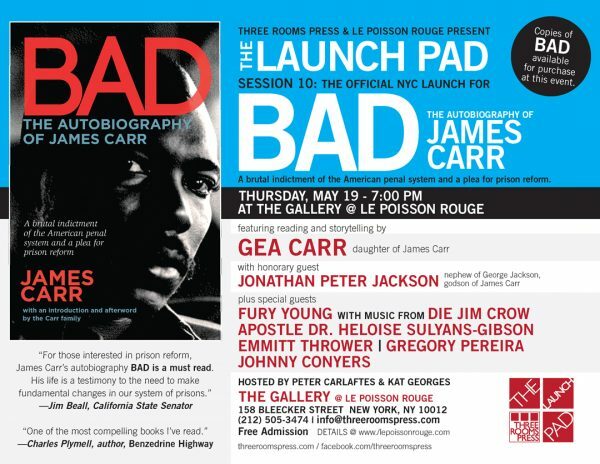 Three Rooms Press presents an evening of reading and storytelling in support of prison reform at the NYC launch of BAD: The Autobiography of James Carr the harrowing, brutal, and unapologetic 1972 memoir by the notorious African-American career criminal who went straight out of Compton to a ongoing cycle of prison terms after burning down his school at age 10. The event will e held in The Gallery at Le Poisson Rouge (158 Bleecker Street at Thompson) on Thursday, May 19, 7 pm. Admission is free. After finally learning to read and write from his cellmate and best friend George Jackson (Soledad Brother), Carr became a early force in the radical stream of the 1960s, working with the Black Panthers, Angela Davis, and the BLA. When finally released, he married, had a daughter, and had just finished recording his memoir when he was gunned down in front of his house in San Jose. The book, initially released in 1975, was suppressed by the California Department of Corrections for its clear-eyed portrayal of the reality of prison conditions. The event will feature readings from the book by Gea Carr (daughter of James) and Jonathan Peter Jackson (nephew of George Jackson and godson of James Carr). Special guests include musician and poet Fury Young, with music from the concept album Die Jim Crow; Apostle Heloise Sulyans-Gibson (singer and leader of Broken Chains Prison Outreach); Emmitt Thrower (filmmaker and director, Wabi Sabi Productions); Gregory Pereira (First Steps 2Urban Outreach); and Johnny Conyers (Exodus Transitional Community). Copies of BAD will be available for purchase at the event. The event is free and open to the public. For reservations and additional information, contact Peter Carlaftes at 212-731-0574 or write info@threeroomspress.com. An unapologetic, brutal memoir from notorious 60s career criminal and Black Panther James Carr. BAD covers Carr’s life from his first arrest at age 10, through merciless stints in San Quentin, through his post-incarceration murder in San Jose in 1972. A savage indictment of the American penal system. Includes a new introduction by his daughter, Gea Carr, and an afterword by his widow, Betsy Carr. Three Rooms Press is a fierce New York-based independent publisher inspired by dada, punk and passion. Founded in 1993, it serves as a leading independent publisher of cut-the-edge creative, including fiction, memoir, poetry translations, drama and art. In addition, Three Rooms Press produces and promotes a variety of literary and cultural events in New York, London, Paris, Berlin, Brussels, Los Angeles, San Francisco, and more, including readings, plays, workshops and concerts. Three Rooms Press books are distributed in the U.S. and internationally by PGW Perseus.